If you suspect that your home may have been damaged by street creep, or that it has any other foundation problem, we're the contractors for you. At Frontier Basement Systems, we specialize in repairing structural issues of all types, and we have a warrantied solution for street creep that will permanently solve your problem. We provide free, no-obligation foundation repair quotes throughout our Tennessee and Kentucky service area, including Jackson, Nashville, Clarksville, the surrounding areas of Owensboro, Murfreesboro, Bowling Green, Philpot, Utica, Fayetteville, Marion, and nearby. Call or email us today to schedule an appointment! At Frontier Basement Systems, we recommend repairing damage done to your foundation by street creep with the GeoLock™ Wall Anchor System. To keep your basement looking its best after installation, we also recommend our Hide-A-Way™ Wall Anchor Covers. These are an especially good option if you're finishing your basement. Their low-profile design will fit in nicely with the design of your finished basement, while allowing future access to anchor plates. We Do Street Creep Repair In Tennessee and Kentucky! At Frontier Basement Systems, we have warrantied solutions for repairing street creep damage to your foundation. To help you decide if our solutions are right for you, we offer free written street creep repair quotes throughout our TN and KY service area. 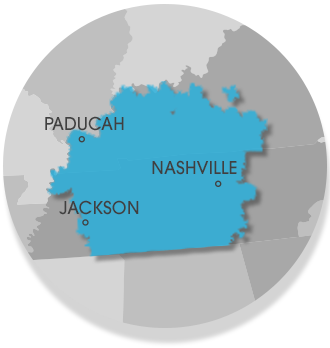 We serve the Nashville, Clarksville, Jackson, area, nearby areas such as Owensboro, Murfreesboro, Bowling Green, Philpot, Utica, Fayetteville, Marion, Mcminnville, Franklin, Leitchfield, Shelbyville, Hartford, Antioch, Paducah and the surrounding regions. To schedule an appointment, contact us by phone or e-mail today!